Join the M9 at the Newbridge Junction Roundabout taking the 4th exit, then join the M9 Motorway (signposted M9 Forth Road Bridge, Stirling). Leave the M9 at junction 10 (signposted Stirling, Callander, Crianlarich). At the roundabout take the 2nd exit onto the A84 (signposted Callander) Continue forward onto the A84 passing through Doune, Callander, Strathayre and Lochearnhead, continue through Lochearnhead to the A85 and up and over Glen Ogle. At Mid Lix turn right onto the A827 (signposted Killin) continue into Killin Village and over the Falls of Dochart. Heading down Killin Main Street you will pass The McLaren Hall on your left hand side. You will pass a Caravan Park on your right, continue driving up past the Golf Course where you will pass another two Caravan Parks on your left. 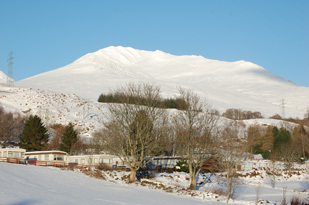 Keep heading along the North shores of Loch Tay until you reach Cruachan Farm Caravan and Camping Park on your right-hand side (approx 3 miles from Killin). Start out on M8 Glasgow Eastbound,Lanarkshire. Branch left onto the M80 (signposted M80 Stirling, Kincardine Br.) Immediately before roundabout bear left onto the A80 (signposted Stirling) Continue forward onto Cumbernauld Road - A80. Entering Chryston Crow Wood Filling Station. Continue forward onto Cumbernauld Road - A80. Entering Moodiesburn At roundabout take the 2nd exit onto the A80 (signposted Stirling) Continue forward onto the M80. At M80 junction 5 keep in right hand lane then continue forward on the M80 (signposted Perth, Stirling) Stirling Service Area (MOTO). Leave the M9 at junction 10 (signposted Stirling, Callander, Crianlarich). At the roundabout take the 2nd exit onto the A84 (signposted Callander) Continue forward onto the A84 passing through Doune, Callander, Strathayre and Lochearnhead, continue through Lochearnhead to the A85 and up and over Glen Ogle. At Mid Lix turn right onto the A827 (signposted Killin) continue into Killin Village and over the Falls of Dochart. Heading down Killin Main Street you will pass The McLaren Hall on your left hand side. You will pass a Caravan Park on your right, continue driving up past the Golf Course where you will pass another two Caravan Parks on your left. Keep heading along the North shores of Loch Tay until you reach Cruachan Farm Caravan and Camping Park on your right-hand side (approx 3 miles from Killin). Click the DIRECTIONS link to visit the AA Route Planner to get more detailed instructions from where you are coming from. If you get really stuck, just give us a call on (01567) 820 302 and we will guide you from there!